I'm fond of the Queen. The Head of the Household here thinks she's a dear. He has personal experience having cooked for her when she was here for the Brisbane Commonwealth Games in 1982. After the meal, the Queen came back to the kitchens to thank the cooks. Unfortunately, in that typical Aussie way, the cooks had been doing some premature celebrating of a successful service with immersion in beer. Protocol was carefully observed by both sides with no major breaches, but it was near run thing. The Head of the Household says she was like a regal granny. The Queen's Diamond Jubilee was observed in Australia, but much less fervently than in the UK (many fewer garden parties and much less inappropriate overuse of Union Jacks). I felt I should do my two cents worth for us closet Australian monarchists and was going to knit this queen by Fiona Goble which was a limited release free pattern that is sadly no longer available. However, some of the younger family members couldn't see the point and dissuaded me in favour of making things for them instead. So here instead is a collation are some people who have patriotically celebrated their love of Good Queen Bess II in grand knitterly style. This is from The Lady Magazine. Free Pattern for the Queen available here. 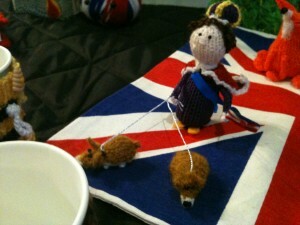 The Queen walking her corgis by Lauren O'Farrell. (Photo from here). This is magnificent. 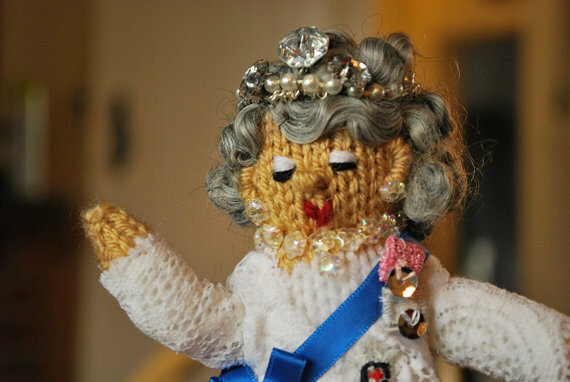 Sheila Carter spent 4 months knitting this tribute to the Queen for her Diamond Jubilee. Read more here. A Royal Carriage by 87 year old Norah Howarth of Cardiff, Wales. Read more here. The Royal family by the WI (British Women's Institute). Read more here. Awesome Yarn Bombing. 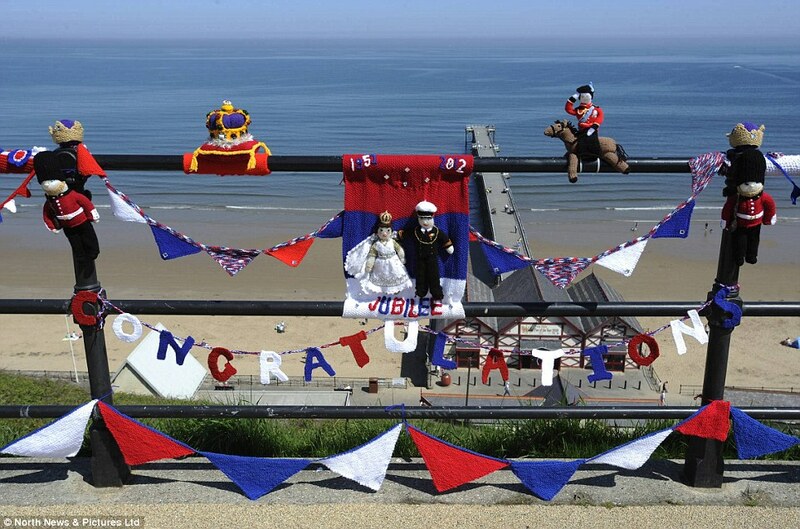 This is on Saltburn Pier in Cleveland and is by anonymous knitters. Picture from here and further story and pictures here. Maybe I could sneak in a Diamond Jubilee themed cushion instead? 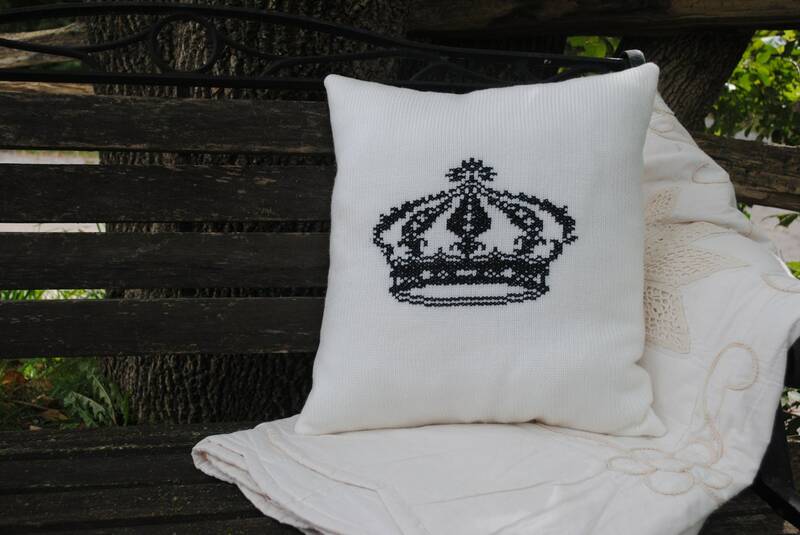 Diamond Jubilee Knitted Cushion (by Linda Bingham on Folksy). By Rowan yarns. (Free pattern available here). And finally, a knitted portrait of Queen Elizabeth II by Sue Bradley.